Agility is great for people who want a fun way to exercise mentally and physically with their dog. Particular gestures, moves, and basic obedience are necessary for anyone interested in pursuing the sport of Agility. In this class you will be taught foundational handling skills and how to introduce your dog to the obstacles. The emphasis in this class is on developing a working relationship with your dog. You and your dog will develop a closer relationship from this new way of responding to one another. This class runs for 6 weeks. Completion of Basic Manners Plus or equivalent required. 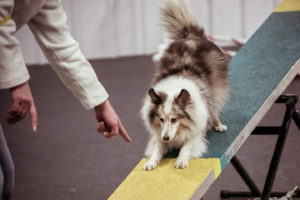 Visit our Agility Class Calendar for start dates and session status.